Location: South of Lawrence on the East side of the Don Valley Parkway, on the south entrance of the CN Rail Tunnel and part of the East Don Trail. Mural Routes had the opportunity to revitalize Toronto’s iconic rainbow tunnel mural. Artists Rob Matejka and Anthony DeLacruz cleaned, scraped, primed and repainted the tunnel entrance so that this much-loved piece of Toronto’s street art history remained strong and able to cheer up the many tired commuters on their dreary ride from the city. 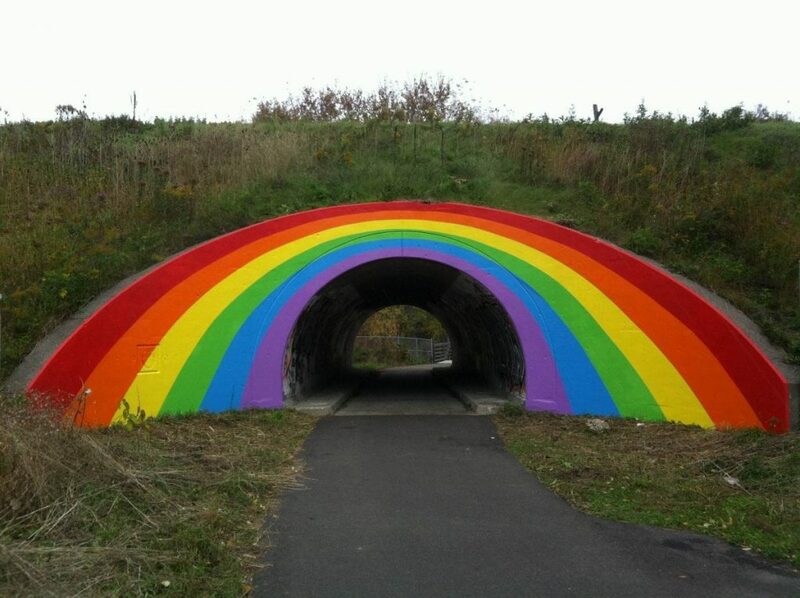 With funding provided by the City of Toronto Parks, Forestry and Recreation Dept, who recognized the power of such an icon and the beautification of city trails, Mural Routes took on the rainbow re-vamp as well as a mural project to paint the inside of the tunnel. The project took place in Spring 2013, involving local youth from nearby Flemingdon Neighbourhood Services. In addition, participants in Mural Routes’ Step x Step: Introduction to Mural Arts and Leadership Training in Mural Making programs were part of the design and painting process for the inside of the tunnel. The original rainbow was painted by BC Johnson in 1972.